I love that by putting the clouds behind her, she actually looks like she's moving through the air! Eeek! That witch is amazing! Love your little scene! Love this, Tracey! 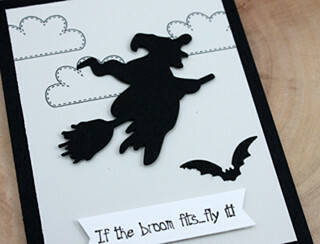 That sentiment is so fun along with your fab witch and cute clouds! This is so cute. It really does look like she is flying through the clouds. Great sentiment, too. Goodness Tracey - you are one busy stamper! 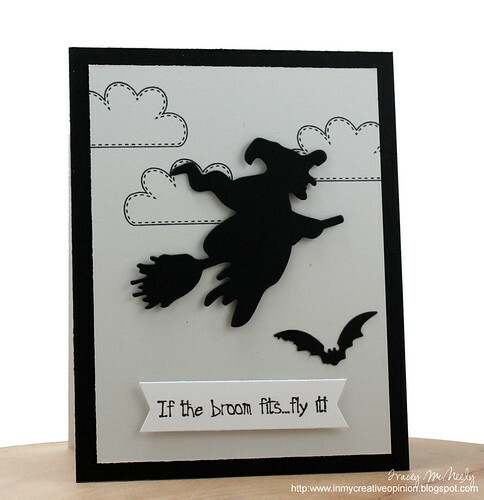 I just love this black and white Halloween card! the witch and stitched clouds are so fun! Love this die set! 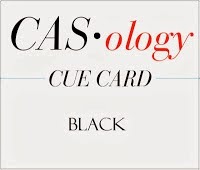 Love your CAS card too! You know, this is really fabulous Tracey! I love the stitched clouds with the black die cuts! When I saw this challenge, I thought hmmm... didn't know if I could come up with anything, but you have inspired me! Love it! So gorgeous!! LOVING the clouds and the witch!!!!! I SOOOO love that witch.. awesome card..
Love it!!! So fun and cool! Ha! I can think of a few people I could send this card to...(am I bad?!?) I love this CAS design and fun sentiment...cute! Fabulous card and great tip about stamping and die cutting, love those clouds. How FUN is this!! Love the sentiment too!! My neighbor used to joke when he saw me sweeping the sidewalk after the hubs mowed the lawn. He would say "goin for a ride" !!! OMGosh, this sentiment is over the top FUN! I love how you created your clouds, too...perfect with your fab witch! Awesome Halloween card, Tracey! she looks really fly near the clouds...really lovely idea on the black cue card..love your card..and love the sentiment too...perfect..